“I have found out that there ain’t no surer way to find out whether you like people or hate them than to travel with them.” So said Mark Twain, and so say I. After college Tom and I rented a tiny little car and drove through Austria, Germany, Switzerland, France and Italy. For weeks we lived on salami, bread, cheese and two euro wine. On that trip, we figured out how to navigate the unfamiliar and the unplanned together. We learned how to get lost, try new things, and tolerate each other’s lesser qualities. Ten years later, we’re still traveling, still planning next adventures. It’s something [we think] we do really well together. 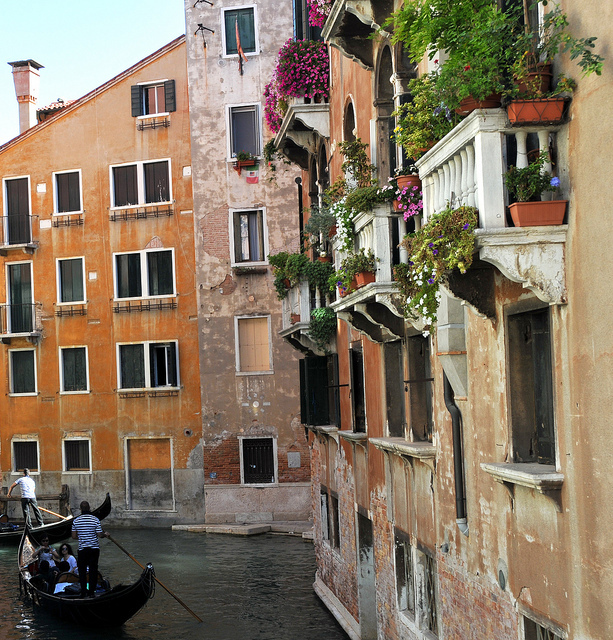 On our last trip to Italy, Tom and I began in Venice. Its beauty was haunting, its romance inescapable. There is a magic that runs through its canals that makes every corner turned prettier than the last. Yes there were crowds. Our only glimpse of St. Mark’s Basilica was fleeting, as we quickly retreated from the hordes of cruise travelers that had no interest in maintaining personal space. 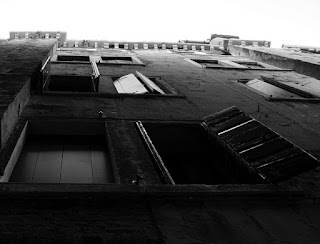 But there are far worse things than having to hide away within the inland waterways of Venice, enjoying a carafe of wine in a small osteria for a few hours in the afternoon. 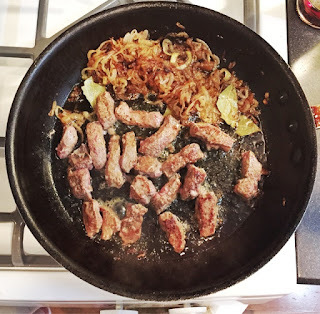 The thing that we both remember best about Venice is a plate of calf ‘s liver with onions- slightly greasy, sweet and sour, perfectly caramelized by a still steaming sear. 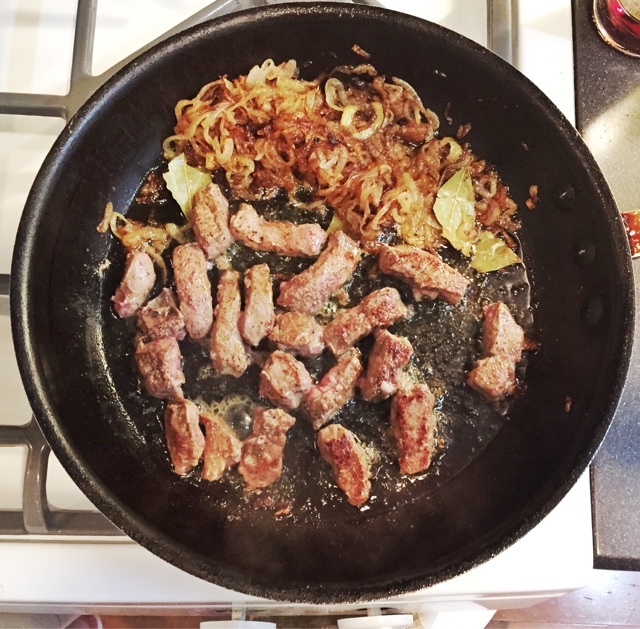 Whenever one of us needs to go back to Venice, I make sautéed calf’s liver for dinner. This weekend Tom and I celebrate seven years of marriage. It’s an adventure that only gets better and I am thankful each day to share this journey with such a remarkable travel partner. Nonna loves calf liver. The glee in her voice when she’s happened across a beautiful piece of calf’s liver is palpable, “It’s so good!” Equally exciting to her is the fact that no one else (who is not me) will eat it. 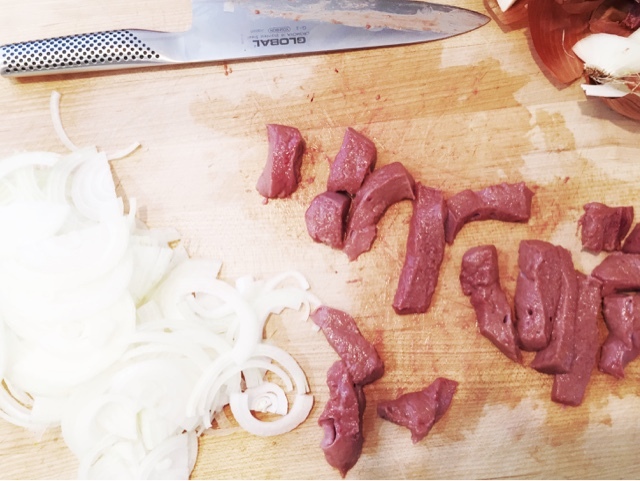 When Nonna makes calf’s liver, she makes it for herself. To begin, take a sharp knife and clean the liver of any membrane or blood vessels before slicing into 1-inch thick strips. 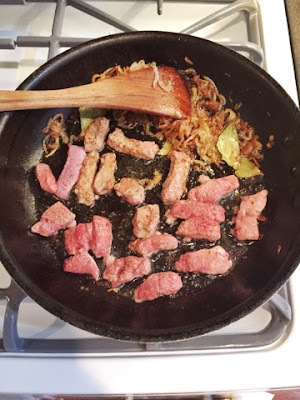 Season the strips of liver with salt and pepper. In a large non-stick skillet heat 3 tablespoons of olive oil. Add the sliced onion, bay leaves and a good pinch of salt. Cook over medium high heat, stirring occasionally until the onions begin to caramelize and take on a deep golden hue, about 10 minutes. Reduce heat to medium, and cook for about 5 minutes more, letting the onions take on a darker color. Add the red wine vinegar. Continue cooking for 2-3 minutes. At this point check for seasoning, adding more salt, pepper or vinegar to your taste. Push the onions off the direct heat, to the side of the pan. Add the remaining 2 tablespoons of olive oil to the skillet and adjust the heat to high. Add the sliced liver and carefully brown on all sides, cooking for 1-2 minutes. 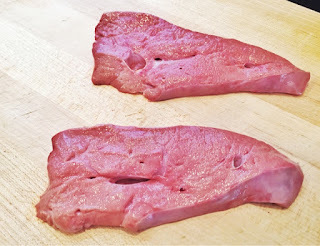 The liver should still be pink in the center when cut with a knife. Not overcooking the liver is crucial to enjoying this dish. 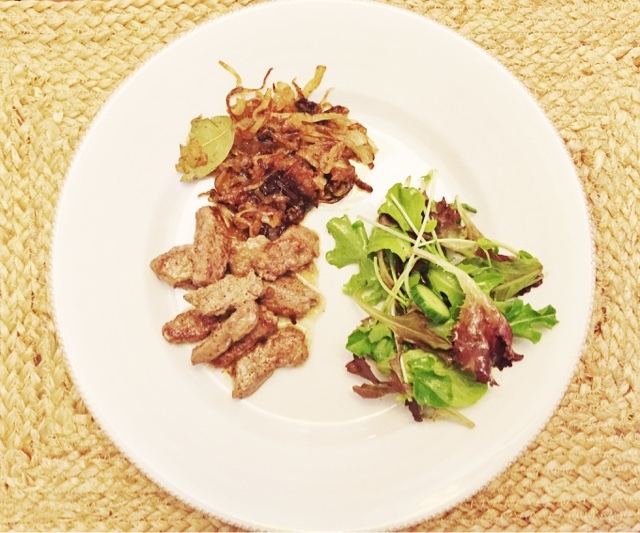 Nobody should ever have to eat well-done liver. It should not be allowed. Serve with a simple salad and crusty bread. This recipe makes enough dinner for two willing adults and one brave toddler.